If you weren’t aware, one of the cause-related awareness campaigns staged through the month of September was dedicated to people living with cerebral palsy, and went by the name of Steptember. Most importantly this initiative of the Cerebral Palsy Alliance, supported by global partner Goodman, is well on the way to crossing its fundraising target of $5 million. It’s fair to say that the calendar of similar events being run on any one day, week or month of the year is certainly a crowded one and it can be a challenge to stay across all of them. At Medianet we often seek ways to add a boost to these campaigns through channels such as our client newsletter Media Movements, social media and alerts we send to journalists from our Medianet Editor Service. One of the trends we would all notice is the naming game that comes with many campaigns. Pride of place for starting the trend probably goes to Movember which originated in Australia more than a decade ago. The rest as they say, is history. Fast forward to 2016 and the phenomenon of finding quirky names for awareness months doesn’t look like fading any time soon. 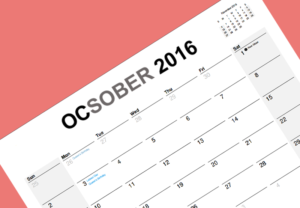 In October for instance is Ocsober, an initiative of Life Education aimed at raising awareness of alcohol-related abuse and raising funds for more drug and alcohol education in schools. Other contenders you can expect to see or hear about this month are Socktober (with the tagline ‘Pull up your socks this Socktober and help sock it to poverty’), Frocktober (a fundraiser for ovarian cancer), Walktober (‘Step out for kids health’) and Dogtober (raising funds for Assistance Dogs Australia). If you don’t fancy wearing a frock everyday with your socks pulled up while walking rescue puppies, all while staying sober, in October, then there’s always Movember to follow. Are you planning an event? We’ve created an eBook with everything you need to know about planning an event for media coverage. Click here to download the eBook and be on your way to running a successful event.